& very interested in the fix you came up with for the horn. If it saves me having to splash out on a new control unit I'm interested! Hope you get the details up soon! Pm you my mobile, maybe easier to explain. Well Kam, thanks for the info. I took some tie out today & managed to get my horn working with the Gen.2 wheel now. As per your info. I was also able to carry out a minor addition to the procedure myself. 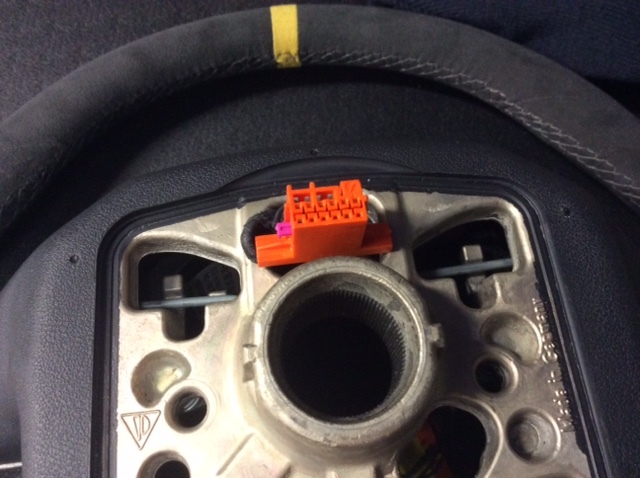 I discovered that the orange multi plug has a small pink plastic clip inside it (see pic) which passes through the centre & holds all of the pins in place. 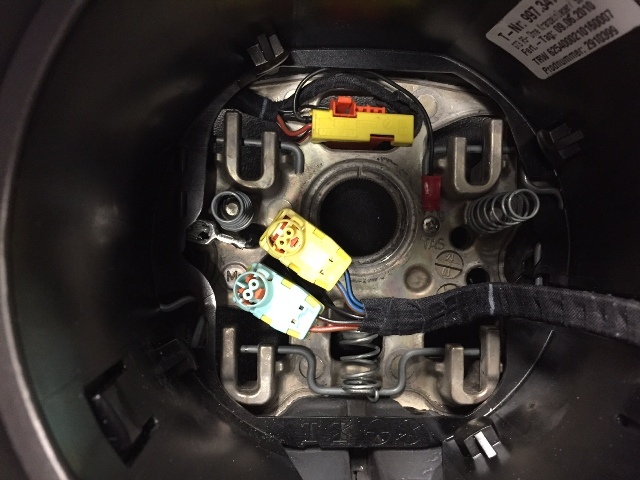 If you pop it out, you can remove the two pins & swap them round, allowing you to use the original spade connector as an earth to the airbag chassis. Afterwards, I was able to simply splice the steering wheel ground to the original wire by soldering & a small piece of heat shrink & re-assemble the connector so it looks pretty much stock. Note: I'm not sure if this would work as easily with a M/F wheel, as it's likely the second earth wire from the original spade connector connects to the M/F controls inside the wheel, but it does work fine with the plain wheel. May even swap mine around and connect the original wire. Research on here seems to suggest that converting my recently acquired sports seats to heated using OEM Porsche parts is a rather forlorn hope. Has anyone acheived a similar outcome using non OEM seat heaters and how and what did you use? I would much rather make everything look standard if possible but as I have luxury of two pairs of seats right now I can work on converting the sports seats whilst the comfort ones are fitted. After a few months, I had the seat bases and backs covered in "Real" Grey Alcantara. How do you get on with putting suitcases etc in the back? Do they squeeze through when fully forward? Don't use the rear seats!, have a couple of other cars to use. Thank you, they are really comfortable due to adding more foam in the base and rears. Mine is very much a sunny day car, but it does road trips so need to pack it! 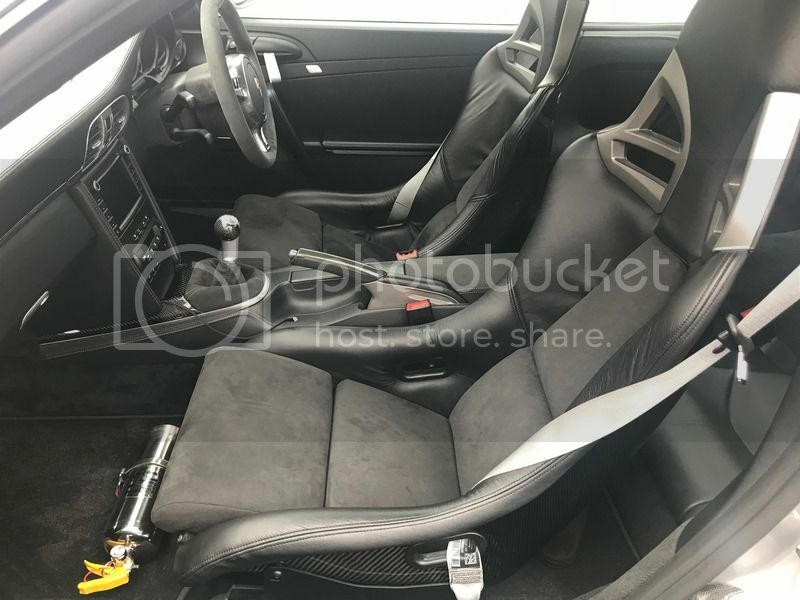 Is the Porsche alcantara black or grey?